A while ago I wrote an article about my most sentimental possession. A word processor that I’ve used to write almost every single article you’ve read on this blog, not to mention dozens of short stories, scripts, NaNoWriMo novels, journal entries, college essays, and other writing easily totaling in the millions of words. I bought my AlphaSmart freshman year of college eight years ago and it’s been with me through some of the most important years of my life. But recently it’s started skipping letters while I type with it, which means it’s time to retire the oldest piece of technology in my arsenal. As mentioned, I used my AlphaSmart heavily throughout college. As an English major, I was always juggling multiple writing assignments at once, and I had a problem with getting distracted by the internet. The AlphaSmart let me hike out to the picnic tables (or the Panda Express) and write without worrying about the many distractions that come with a computer. A friend of mine had one and we used to use its infrared function to pass notes in class. Its battery life was another perk; every summer my family hikes out into the Sierras for a week and my AlphaSmart let me continue writing in a format I could upload to my computer when I get home. After college I moved to San Francisco, then Ohio, then Texas, then back to California. That, coupled with my job representing Legends of Equestria at pony conventions meant I spent a lot of time on trains and planes, another environment where I preferred the AlphaSmart as there weren’t always outlets to plug a computer into. I’ve also been to Europe several times, meaning my AlphaSmart has seen Britain, Scotland, France, Greece, Rome, Italy and Germany. It really feels like the end of an era that it won’t be with me anymore. The real question is what to do now. The most obvious idea is to just buy another AlphaSmart, though the company went out of business years ago and I’ll need to buy one secondhand from sites like Amazon or eBay. 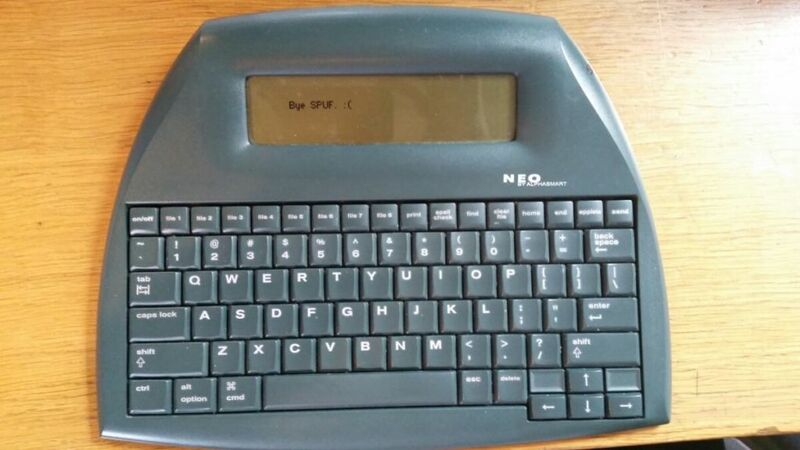 But I am also considering trying a new device called the Freewrite that only recently came out. Marketed to writers, it’s basically a portable mechanical typewriter that comes with cloud support, so you can upload your writing directly to Google Drive. According to its FAQ it has every advantage that I enjoyed with my AlphaSmart, from long battery life to simple USB compatibility to sizable on-board storage. In addition, the mechanical keyboard and E-Ink Screen are both features I’ve used in other devices and would definitely be improvements to the AlphaSmart’s LED screen and laptop-style keys. But I’m grappling with the $500 price tag, because I’d rather get a better desktop computer if I’m dropping prices like that on tech. 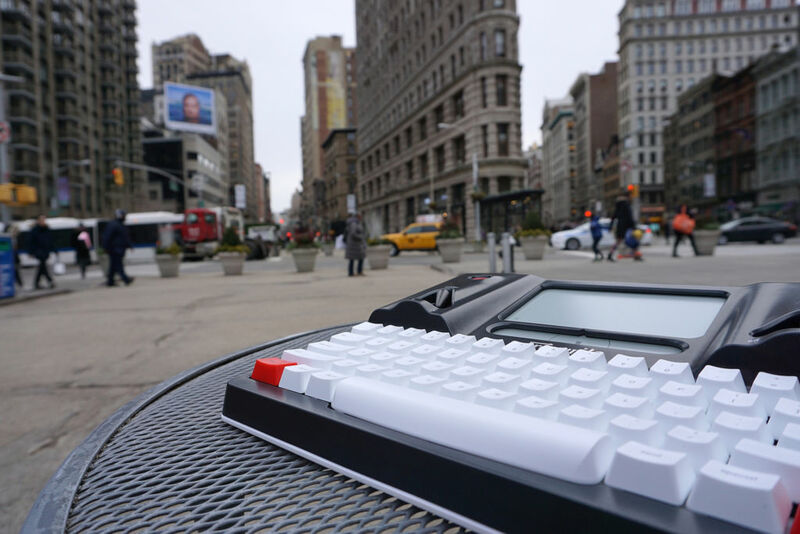 I’m also a bit worried about those giant white keys, I feel like the Freewrite would break if I stored it in my backpack like I’ve always done with my ultra-durable AlphaSmart. So I’ve got a decision to make. But worst case scenario, I’m more than prepared to buy another AlphaSmart, and heck maybe a backup so I can be good for another 16 years. My first AlphaSmart was everything I could have hoped for, and the conclusion of its eight-year lifespan is more a testament to its extreme capability than a reason for mourning. As Dr. Seuss would say, don’t cry because it’s over, smile because it happened.